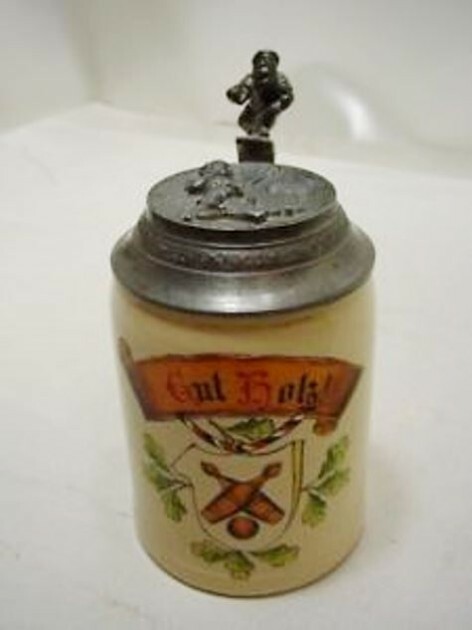 OR: ANY OF THE RECOMMENDED STEIN DEALERS / AUCTIONEERS AS LISTED ON MY “LINKS” PAGE. I just do not have the TIME OR INCLINATION TO APPRAISE! a bunch of steins (I get about 10 to 20 requests every week !!! 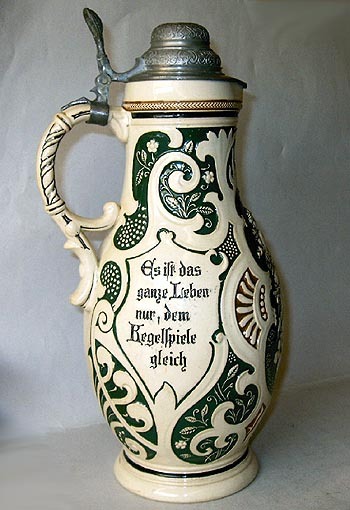 There are way too many variables► condition, location, time of year, present trends in stein/ drinking vessel collecting, local (and now national) economics; but by far the “biggest problem of all ….in communicating “so called values” are the prior expectations by the owner[s]! (which are usually based on hearsay and old, old rumors provide by other family members!! 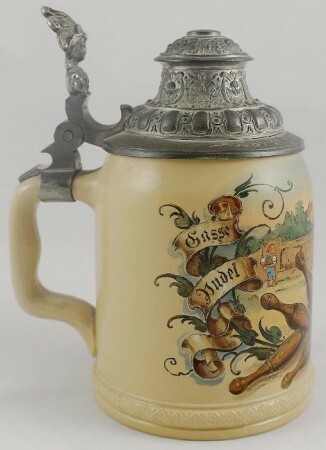 This web site was started as an informational site for beginning beer stein collectors that would be looking for the info and not the general public. but this site does have its own search engine [top right on each page!] 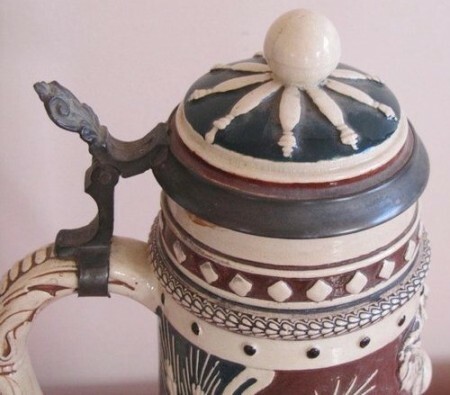 SO if one puts in “Wood Steins” or “Hand painted steins,” it will give one a list of all the pages that has that should have that subject matter word within it. NOTE: I am sorry… but this feature is case sensitive (A “Word Press: feature, and not MINE !!!!! In 1930, British anthropologist Sir Flinders Petrie, along with a team of archaeologists, discovered various primitive bowling balls, bowling pins and other materials in the grave of an Egyptian boy dating to 3200 B.C., which was over 5200 years ago, very shortly before the reign of Narmer, one of the very first Egyptian pharaohs. Their discovery represents the earliest known historical trace of bowling. 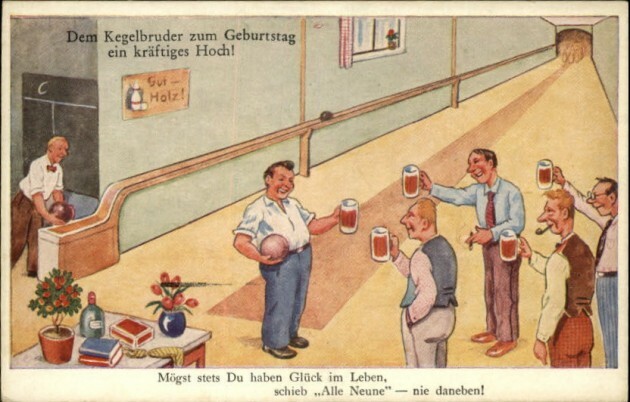 Others claim that bowling originated in Germany around 300 A.D., as part of a religious ritual in which people would roll stones at clubs (or “kegels”) to absolve themselves of sins. 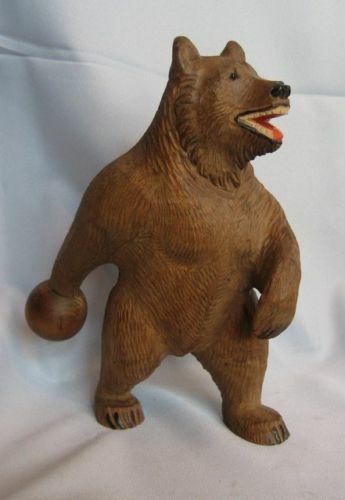 A Black Forest (Swiss made) Bear showing that bears really do something else in the woods !! A site in Southampton, England claims to be the oldest lawn bowling site still in operation, with records showing the game has been played on the green there since 1299. The first written reference to bowling dates to 1366, when King Edward III of England banned his troops from playing the game so that they would not be distracted from their archery practice. It is believed that King Henry VIII bowled using cannon balls. Henry VIII also famously banned bowling for all but the upper classes, because so many working men and soldiers were neglecting their trades. 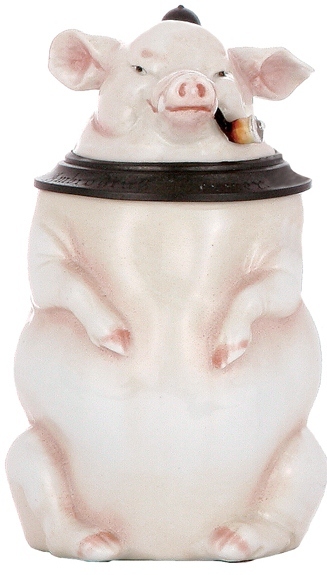 The monkeys for “See no evil, hear no evil, speak no evil!” A very unusual variant for a German “kegels” glass stein with a tin (not pewter) lid. Circa 1914 or later. 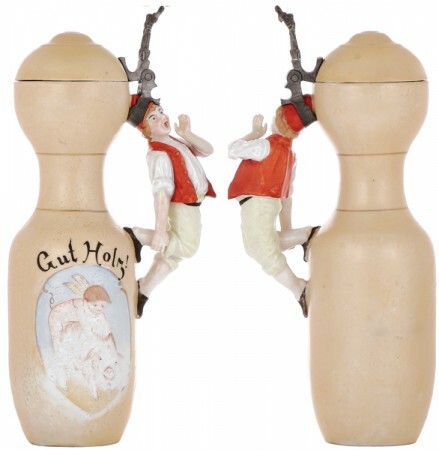 In Germany the game of Kegel (Kegelspiel) expanded. 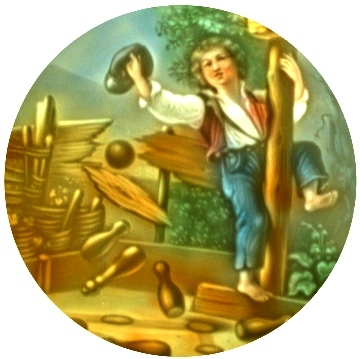 The Kegal game grew in Germany and around other parts of Europe with Keglars rolling balls at nine pins, or skittles. 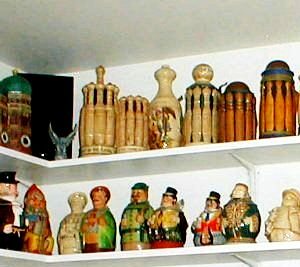 To this day, bowlers in the United States and United Kingdom are also referred to as “keglers”. 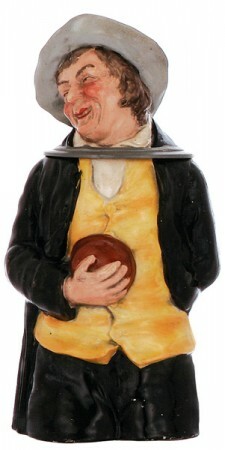 Ninepin bowling was introduced to the United States from Europe during the colonial era, similar to the game of skittles. 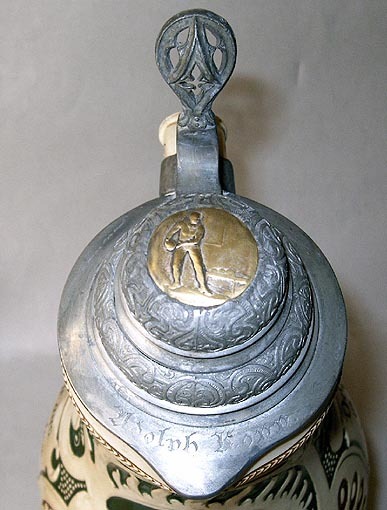 It became very popular and was called “Bowl on the Green”. The Dutch, English, and Germans all brought their own versions of the game to the New World, where it enjoyed continued popularity, although not without some controversy. 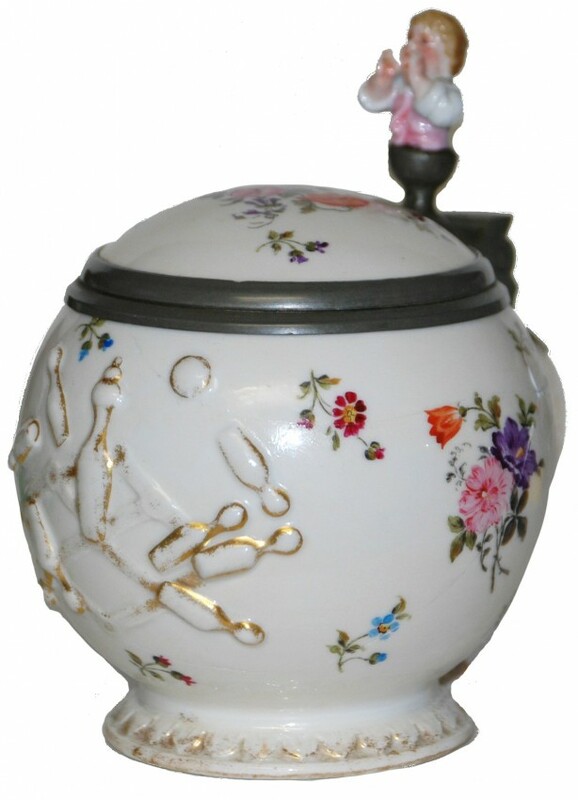 I am thinking the lid might have been put on backwards on this piece? The ball is at the opposite end of where the gnome would have thrown it. Maybe the maker thought the two balls would have been too close then, anyway, very unusual, hey? 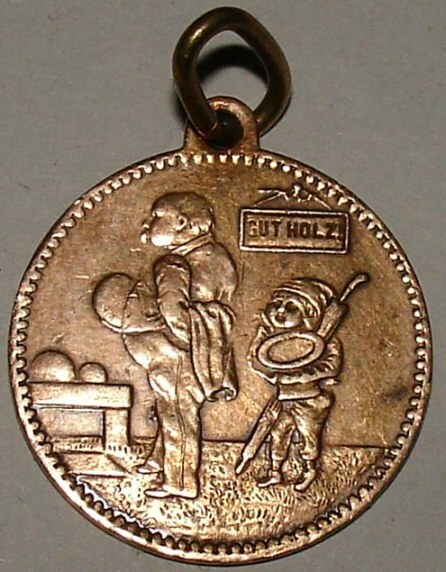 In 1841 a law in Connecticut banned ninepin bowling lanes due to associated gambling and crime, and people were said to circumvent the letter of the prohibition by adding an extra pin, resulting in the game of ten-pin bowling. 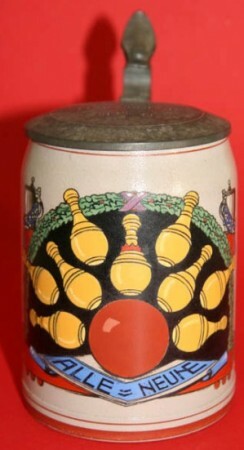 A painting which dates from around 1810, and has been on display at the International Bowling Hall of Fame and Museum in St. Louis, Missouri (Jan 26, 2010: located at the International Bowling Campus in Arlington, Texas), however, shows British bowlers playing the sport outdoors, with a triangular formation of ten pins, chronologically before it appeared in the United States. 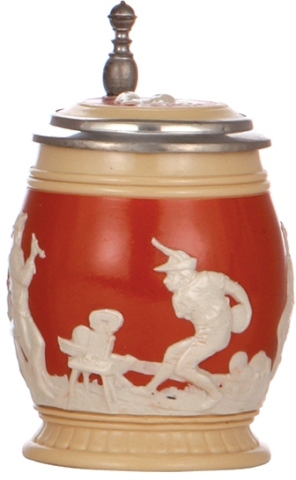 A photograph of this painting appeared in the pages of the US-based “Bowler’s Journal” magazine in 1988. 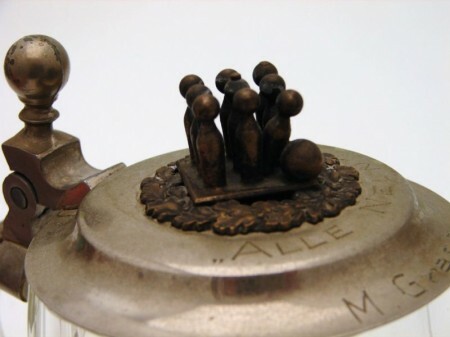 Modern American ten-pin bowling is most closely related to the German nine pin game Kegeln. 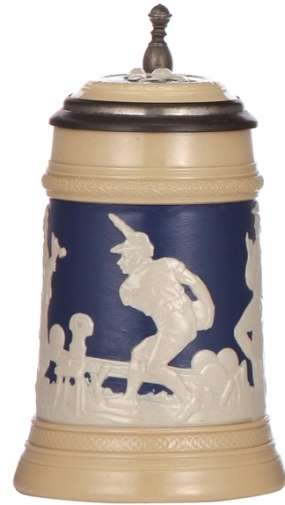 Germans were instrumental in fostering the game’s popularity as they formed their own bowling clubs both before and after the American Civil War. The first indoor bowling alley was Knickerbockers of New York City, built in 1840. The Brunswick Corporation’s addition of bowling equipment to their product line also served to increase the sport’s popularity. 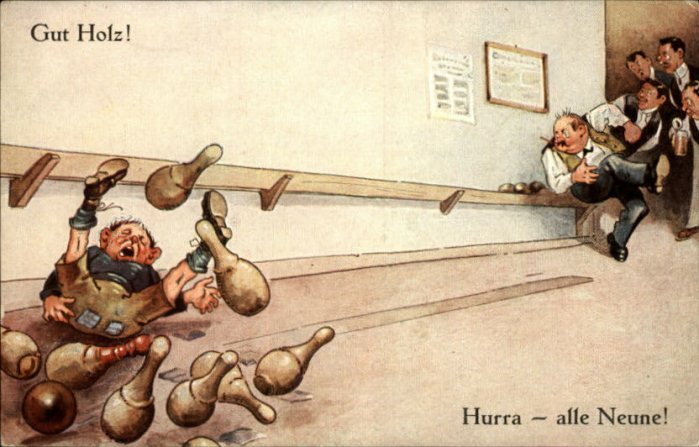 In 1914 Brunswick replaced their line of wooden bowling balls, mostly made with lignum vitae, with hard rubber Mineralite bowling balls. The change was met with great approval. Since being brought to the United States from Europe, ten-pin bowling (a modern version of the game of skittles) has risen in popularity as its technology has improved. The sport is most popular in the United Kingdom and the United States. 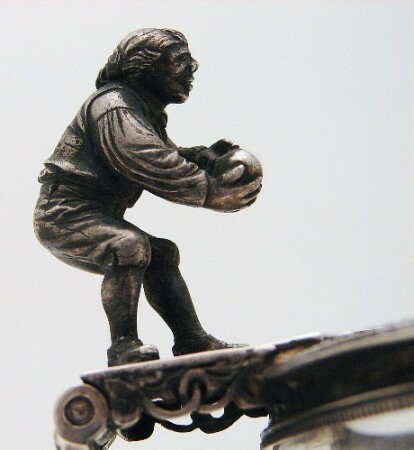 Both nations maintain national regulatory organizations that govern the sport’s rules and conduct, and many of those countries’ best players participate in tournaments on both the national and international stage. Because of the rise in popularity, many companies are now making bowling balls and apparel for professionals as well as for recreational bowlers. Bowling has also become more prevalent in the media in recent years, with the continued popularity of bowling publications and the appearance of films centred around the culture of the sport. However, the sport continues to face challenges in garnering mainstream coverage of the athletic aspects of the game. 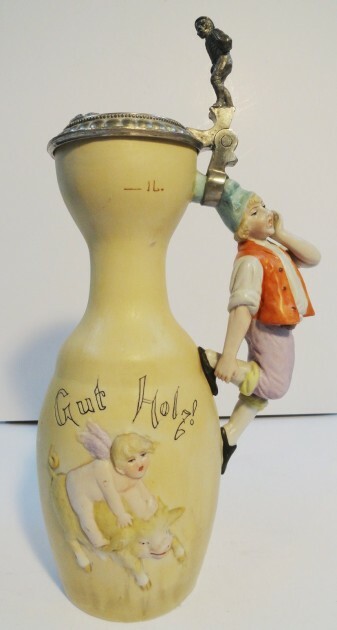 1.0L, 12.2 ht., porcelain, by E. Bohne & Söhne, Bowling Pin, porcelain lid. 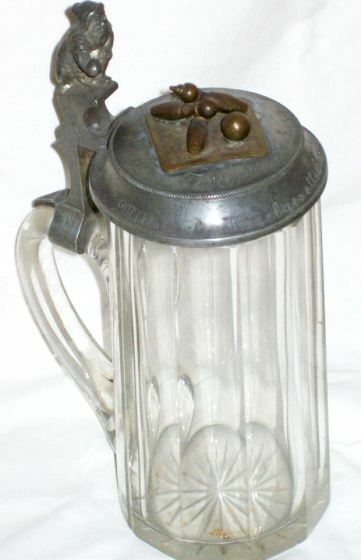 Almost the same stein as above, but with a pewter “kegels” lid, below ▼, and thumblift. 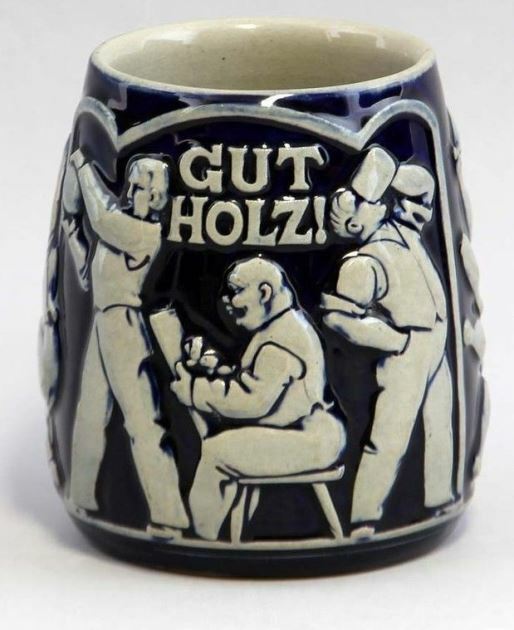 Gut Holz = Good wood! Another view of an old time German Kegels alley on a postcard. This time with flowers and books (?) and of course beer. A poodle [?] 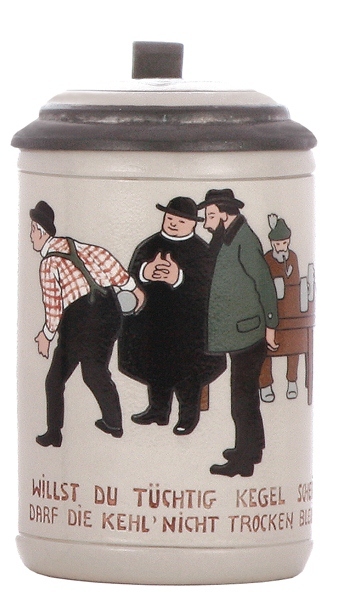 kegler character stein . Hard to locate. 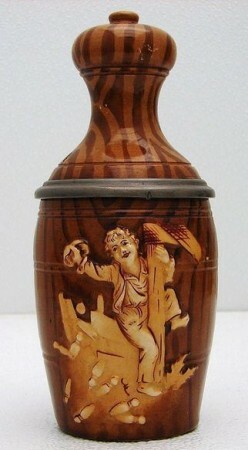 .5 liter stoneware. Design is by Fritz Ringer. 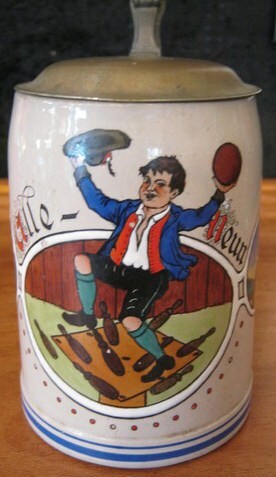 A “red seal” Roemer celebrating the game —- most likely by Theresienthal glashutt. 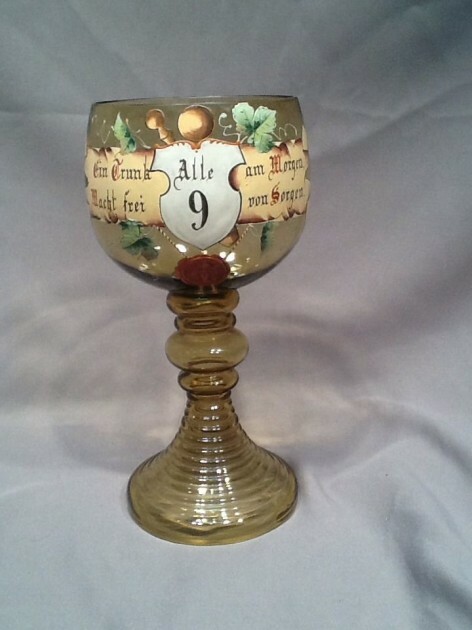 This glass roemer was obviously used by someone who liked German white wine with his Kegels better than beer. In past due retrospect, it may have been owned by a woman. 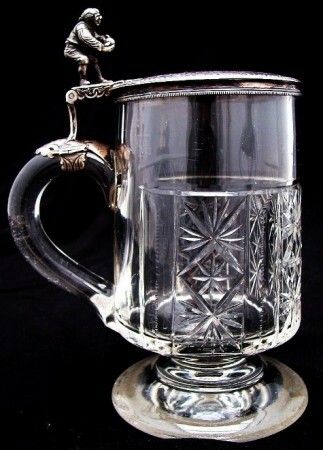 A little nicer cut glass stein with a silver lid and a great thumblift of a kegeler. 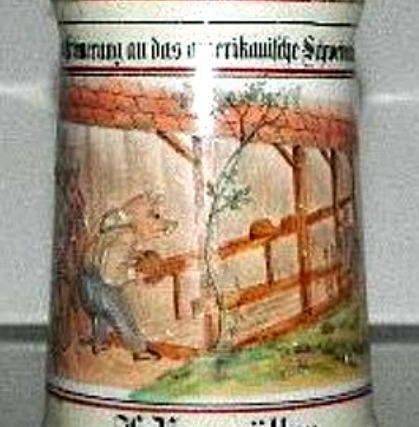 A “Kegels stein.” V & B Mettlach No. 280, hand painted [?] and signed by van Hauten. 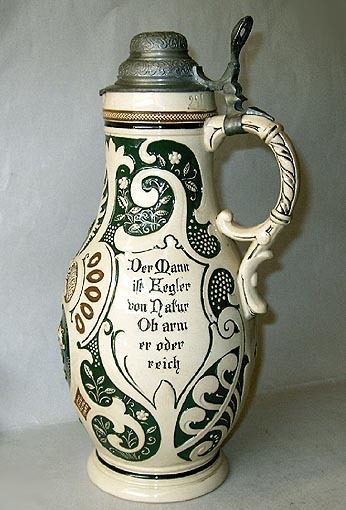 Another .5 liter V & B Mettlach. 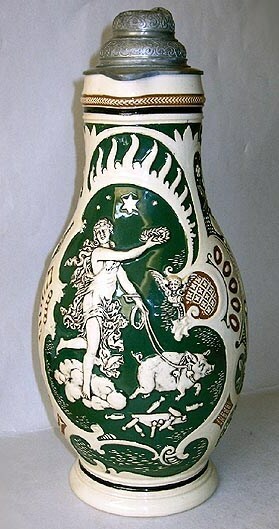 No 285 , Dated 1889. 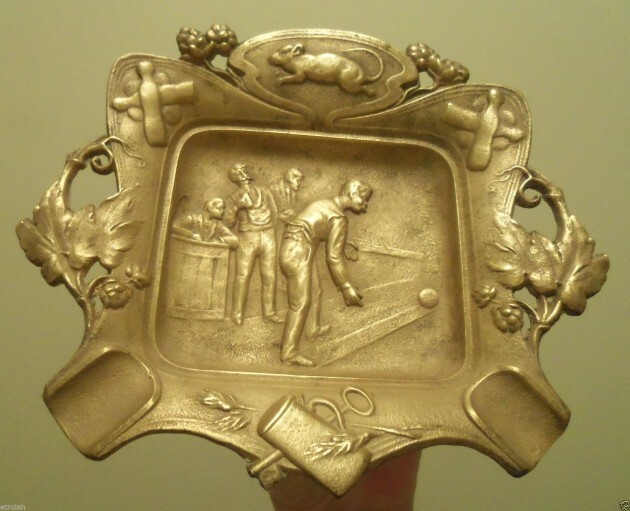 A very well done one liter pottery relief – BUT no pig! So what was the relationship with pigs and kegels? Pigs for the most part are disdained because of their nature and dirtiness. Even the ear of corn which was considered lowly as it is mostly “only pigs food” back in olden Germany. 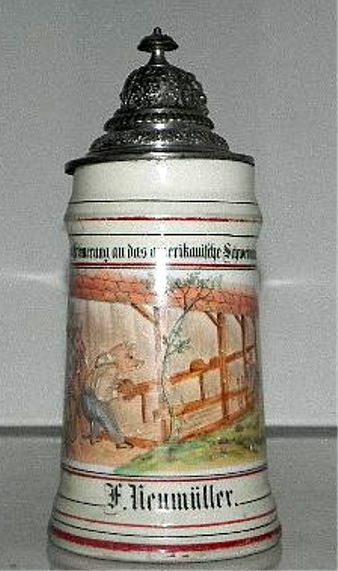 But pigs in German sports culture for some reason (long since faded away) means “Good Luck!” and the phrase “Viel Gluck” (To your good welfair!) 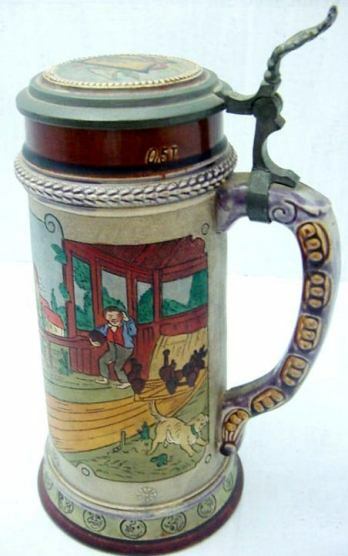 may be seen on lots of “kegel” related steins. 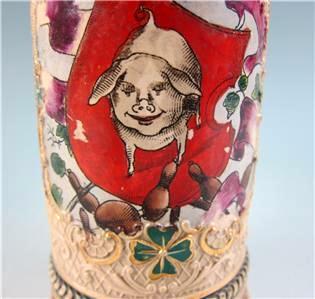 A very unusual 2 liter pottery relief server showing “Fortuna” (Good Fortune) being led by a pig. The kegels are all down! In the past I have wondered why so many of the pig characters existed, as the German thought they were dirty animals and looked down on them. (I do not have much to wonder about everyday do I?) It was not until I started writing this article that it even crossed my mind that these characters were “most probably” related to the game of kegels and ITS”Good Luck” more than just the representation of any one type of animal. 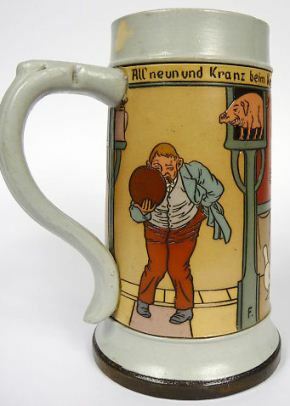 This theory was further shown to be true after I located a .5 liter pottery Character pig stein with a bowling scene on its belly ▼. gonna tell which one is which? – Dat’ll be grand, says Paddy. gonna tell which is which? – Ahh, dat’ll be grand, says again Paddy. – Good man — dat’ll be grand, says again Paddy. fook are we gonna tell which is which? KEGEL PINS AND SET UPS. 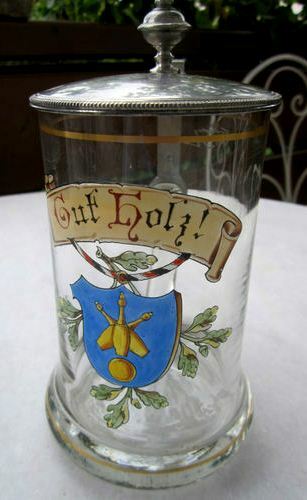 Shown above – 5th stein from the left. 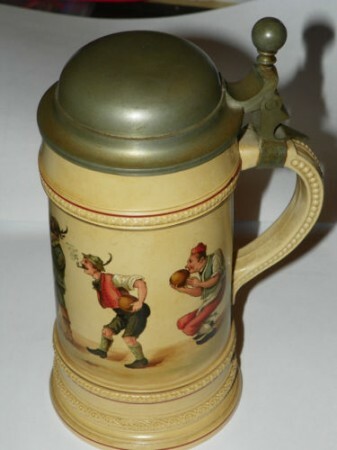 Photos above are from fellow Gambrinus [Beer Stein Collector’s Club of VA., DC. and MD.] member W. Barney. 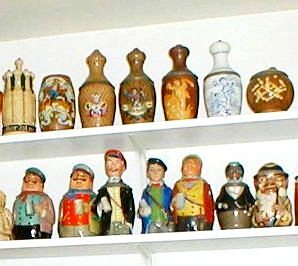 The top row shows some of the diversity of collecting “Kegels” related steins. 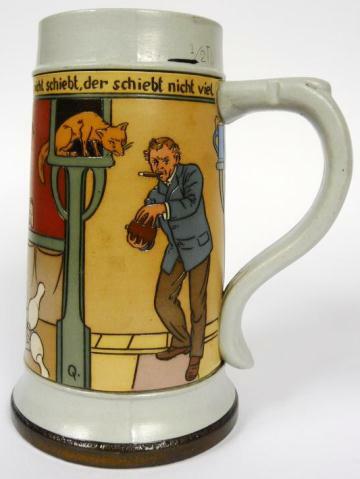 “He’d rather bowl than eat!” German but made for the American / English speaking markets. Ca 1900. 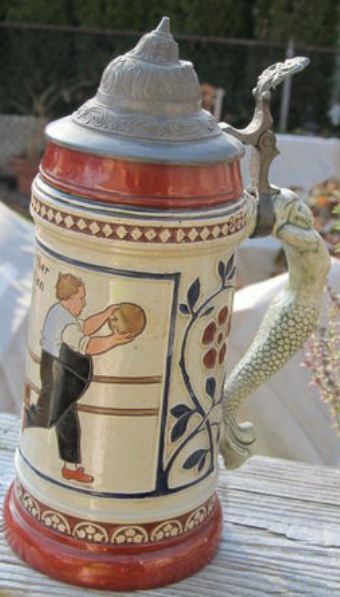 Why the mermaid handle? Just came with that mold number I believe. = It has no has significance to the scene. 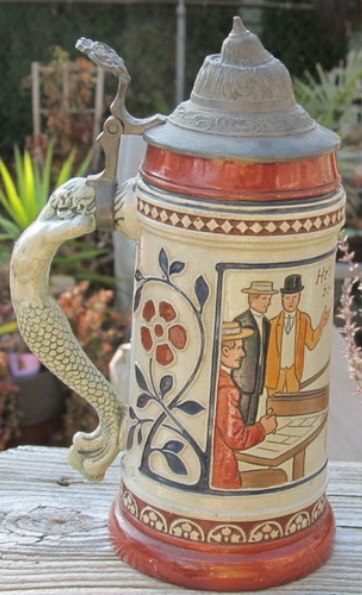 A much prized .5 liter, Ca. 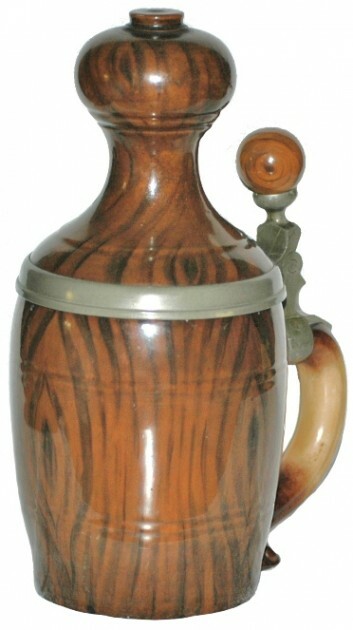 1890, blown glass stein. 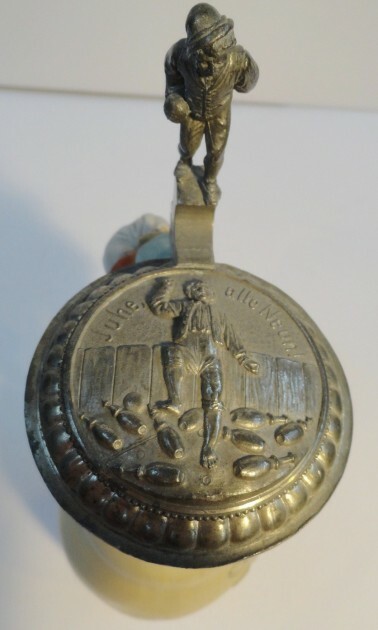 It has pins, pigs and dwarfs, and a very nice pewter lid. 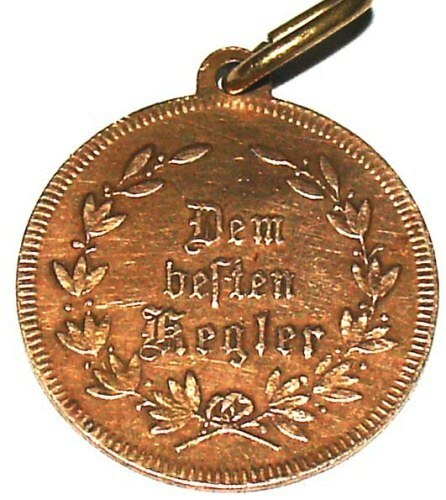 What more could any kegeler want? 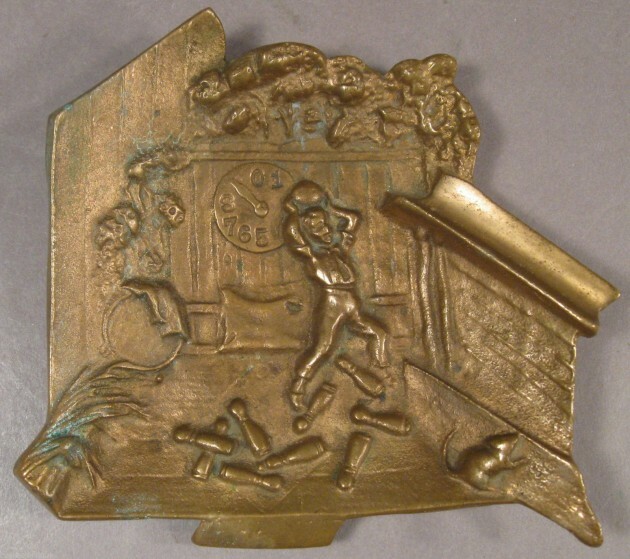 A .5 lier stoneware relief made about 1960. [+ or -] 10 years] I believe , and inexpensive when found. 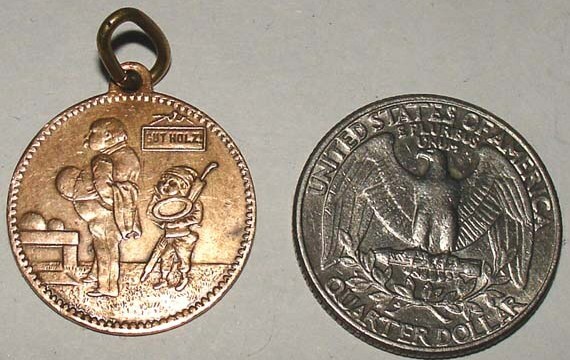 More than likely the same maker as the one above. 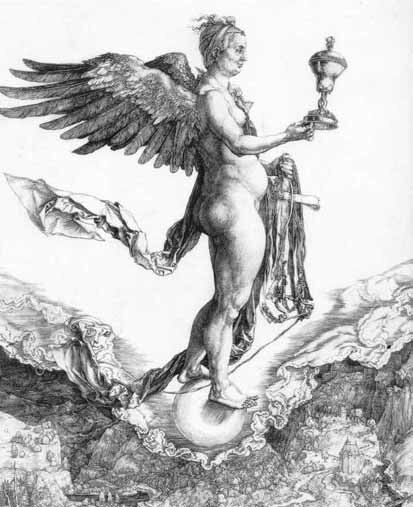 Editor’s notes: Where are the dedication steins to bowling / kegels tournaments, as there were schutzenfests? 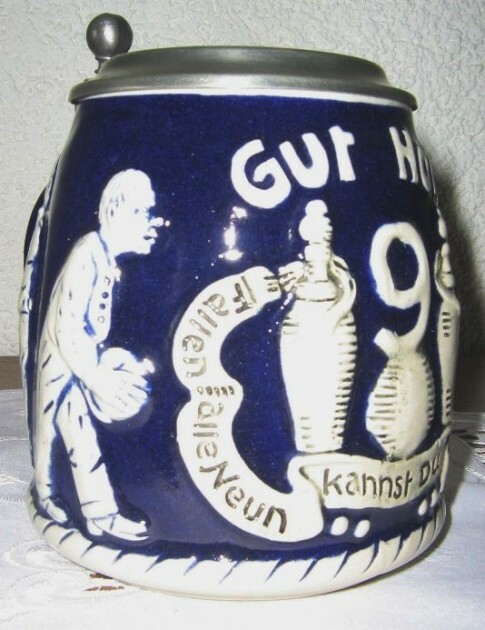 I have never seen even one dedicated to such on a German stein! Why, as popular as the sport was? There were at that time probably no monster alleys as we have here now in the USA, but still they loved to compete……….. and drink. 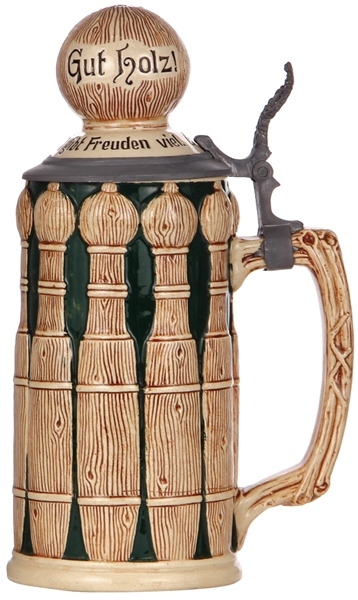 For your next bowling party: A set of four, .3 liter, #2211. 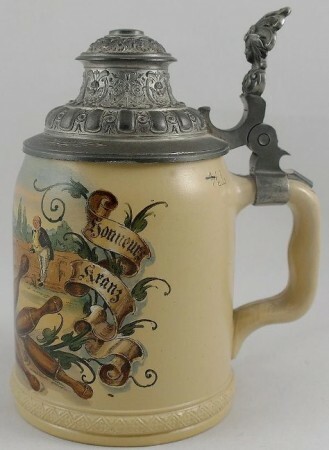 Two V & B Mettlach incised steins. [L] No. 2959 [R] No. 2??? Did you notice the little pig on the stand just to the rear of Herr Kegler?? Side scenes on the V & B Mettlach stein above on left . 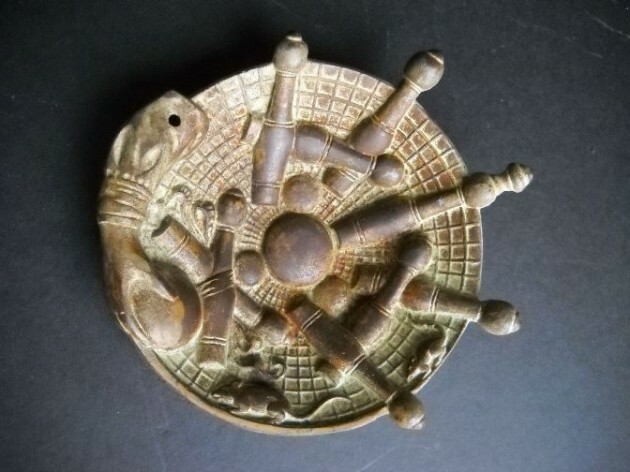 While surfing the net for interesting brass items I found three pieces devoted to the game Kegels. If one looks closely they will find a rat (or a very fat mouse) on each one! 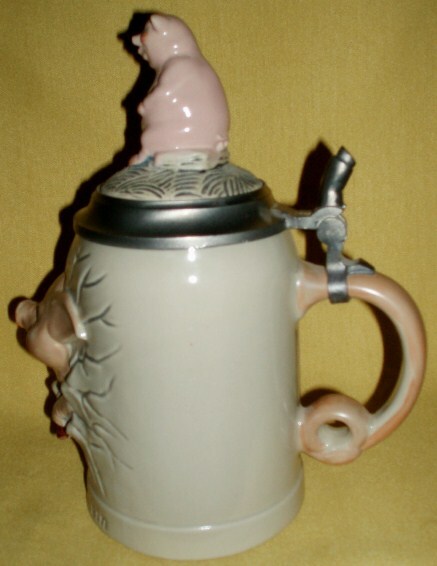 What I find extremely interesting was the review of all the Kegel steins pictured above NOT ONE SHOWS A RAT! 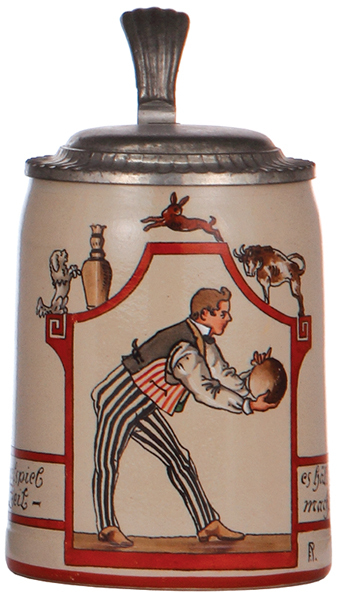 If a bowler doesn’t hit not even one pin it is called a “Pudel (poodle) or a Rat” The Name Rat is primarily used in the Berlin area. 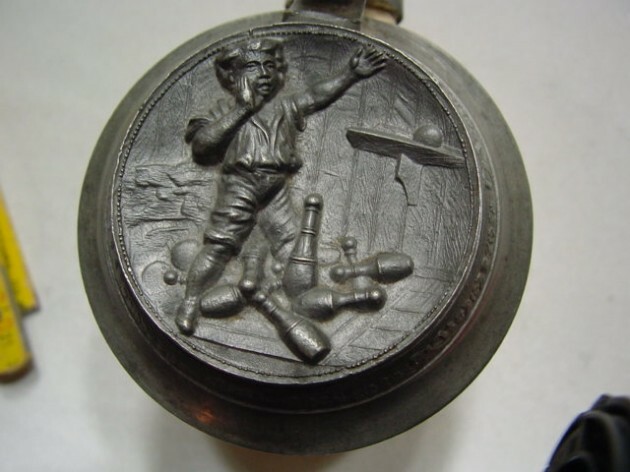 The bowler with the most unsuccessful throws gets a Rat-trophy like your ashtrays or the ones below. 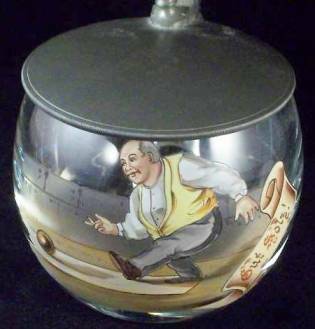 ▼ KEGELS ASHTRAY… BUT USA MADE,,, BY NATIONAL BRASS AND IRON WORKS CA. 1910. Glass roemer obviously for someone who liked German white wine with his Kegels better than beer . Or perhaps it was owned by one of the ladies shown below ▼ ?? 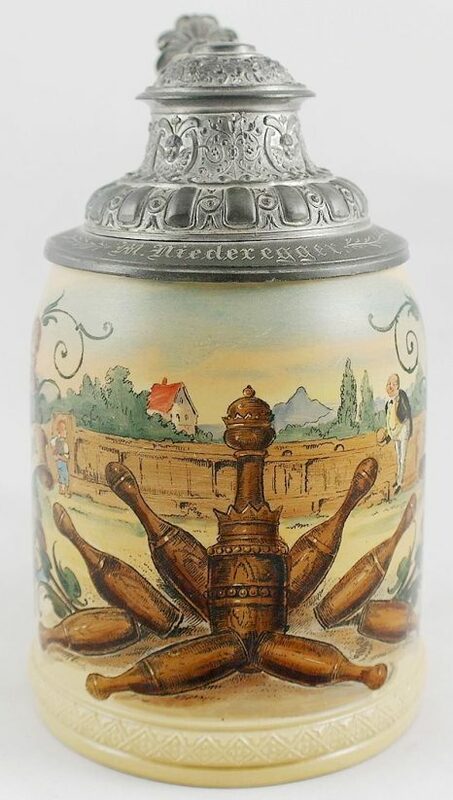 German women bowling on a .5 liter V & B Mettlach stein, No. 2808.
more photos ready for sorting and posting at later date.